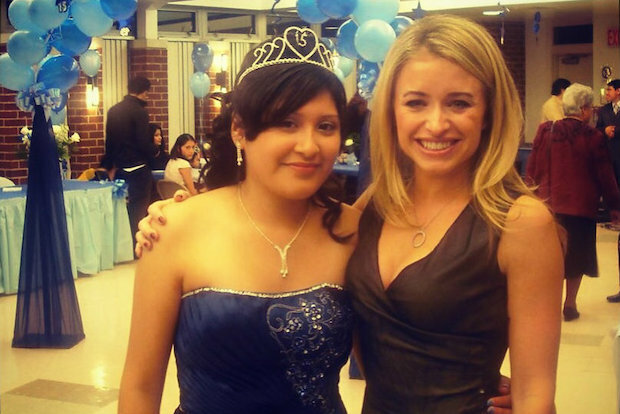 GREENWICH VILLAGE — When Melissa McGowan started mentoring East Harlem student Vanessa Montebello six years ago, she intended to help the teen succeed academically. Now, McGowan is helping Montebello's family rebuild their home, after they lost everything in the fatal gas explosion that rocked the neighborhood in March. McGowan, a Gramercy investment executive who moonlights as frontwoman for rock band Apology Accepted, is hosting a benefit concert Thursday night for Montebello and her family. The show at Bleecker Street venue The Red Lion will feature Apology Accepted, with all proceeds to be given directly to the Montebellos, McGowan said. “It’s kind of a starting point for them to be able to rebuild,” McGowan said. Montebello, now a sophomore at City College studying social work, was living on Park Avenue with her parents and two siblings when the explosion leveled their building and a neighboring one, killing eight people and injuring dozens. No one in the family was harmed in the blast, but their belongings were destroyed and they were forced into temporary housing, McGowan said. Little Sisters of the Assumption Family Health Service, the East Harlem nonprofit that initially brought McGowan and Montebello together for mentoring, contacted McGowan shortly after the explosion to tell her that Montebello and her family had been displaced. Although McGowan and Montebello’s formal mentoring relationship had ended, the two women had kept in touch, and McGowan wanted to help. Her friends and Apology Accepted bandmates helped her plan the show. “It’s just been a really positive experience to see how much people emotionally connect with that sort of need,” McGowan said. The Red Lion provided the event space and support staff free of charge for the benefit, a manager said. The show starts at 7 p.m. on May 29 at The Red Lion, 151 Bleecker St. Tickets cost $30, and McGowan is accepting donations as well.